Now we’ve said goodbye to 2017, a year that brought us buildings such as LEGO House from BIG, Apple’s ‘Spaceship Campus’ HQ, as well as a whole host of exciting developments here at Selo, it’s time to look forward with excitement to some of the stunning buildings that will be completed over the course of the new year. We’ve selected our top five picks as we wait in anticipation to see these innovative buildings reach completion. The design for this unusual and highly original building was first unveiled almost a decade ago by Rem Koolhaas’ firm, OMA. The Taipei Performing Arts Center, a theatre complex in the Taiwanese capital, is centred around a transparent cube, giving the building an appearance quite unlike any other. The Taipei Performing Arts Centre includes three auditoriums, each of which are designed to function independent of one another, but which also share backstage space and mechanical facilities. Bjarke Ingels’ design for the Amager Resource Center, a Copenhagen power plant, is perhaps the most innovative and playful design of 2018. The building, which aims to, in the words of its architect, “transform people’s perceptions” about public utility buildings, includes a ski slope on the roof, and a chimney that blows smoke rings. Another strange and highly distinctive building set for completion this year is Paradise City by MVRDV, an entertainment complex in Seoul, South Korea. The complex includes a nightclub and a shopping centre and is set to form the centre of a new tourist district in Seoul ahead of the 2018 Winter Olympics. The originality of the building comes from the ‘golden blob’ which is draped like a giant curtain over the facade of the building, a feature which will be visible to visitors flying into Incheon airport. The Grand Egyptian Museum was subject to a record-breaking 1,557 entries when the competition to design the building was announced in 2002. Sixteen years later, and after numerous delays which have seen costs exceed $1 billion, the world’s largest archaeological museum is finally set to open in 2018. The stunning triangular design has been constructed to echo the design of Egypt’s most famous landmarks, the pyramids. This spectacular design from Zaha Hadid Architects has been described as the “world’s first free-form exoskeleton high rise”. 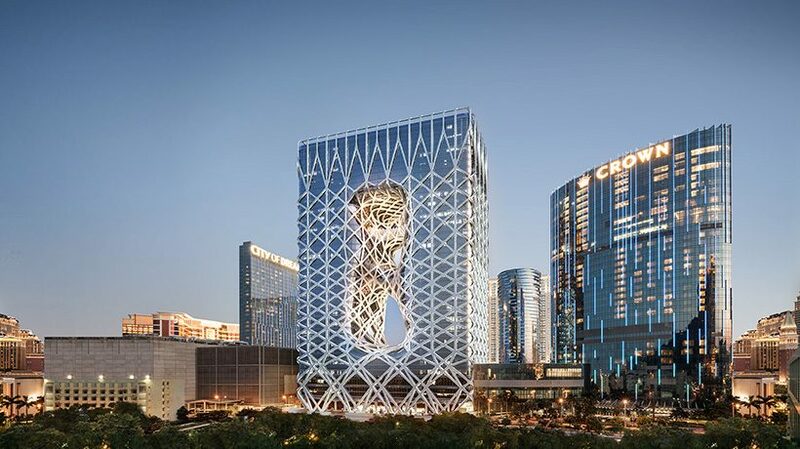 Situated in Macau’s ‘City of Dreams’, a premier leisure and entertainment destination, the building has been designed as a single “sculptural element”, with the facade united by a breathtaking exposed exoskeleton mesh structure. Uniting the two towers which form the basis of the building are two organically-shaped bridges, which give the building a kind of ‘figure of eight’ appearance. We are passionate about architecture and innovation and love to keep up with the trends in our industry to support and advise our clients. If you have a project coming up, please get in touch to discuss your requirements. © All images are copyright to their respective owners.